Wet/Dry Car Vac - $15/1 Or $25/2 Plus FREE Shipping! You are here: Home / Great Deals / Wet/Dry Car Vac – $15/1 Or $25/2 Plus FREE Shipping! Wet/Dry Car Vac – $15/1 Or $25/2 Plus FREE Shipping! Keeping the car clean during the summer can be pretty challenging – from beach sand to spilled drinks and french fries every where – it’s hard to stay on top of it. 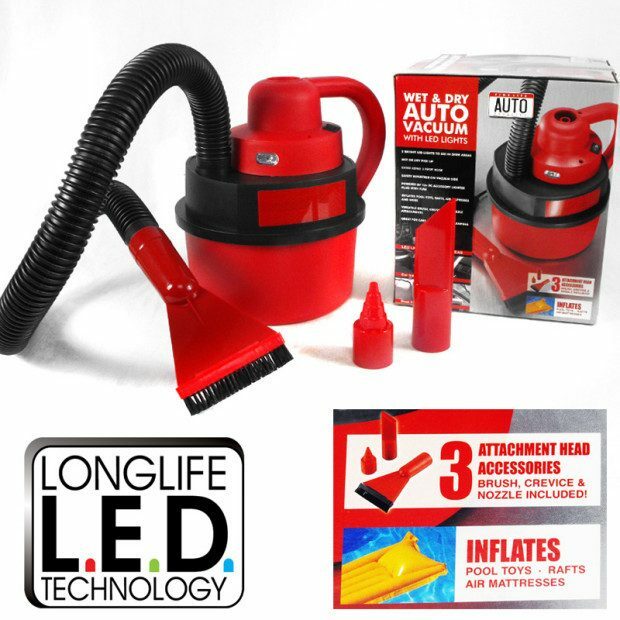 Get help with the Wet/Dry Car Vac – $15/1 for Or $25/2 Plus FREE Shipping! Small enough to fit in the trunk but big enough to handle your wet and dry spills. The vacuum features a 3ft hose and 3 attachments (brush, crevice and nozzle). You can also use it to inflate everything from pool floats to inflatable mattresses!